Ferns are relatively flat, making them particularly amenable to a variety of illustration techniques and decorative uses. 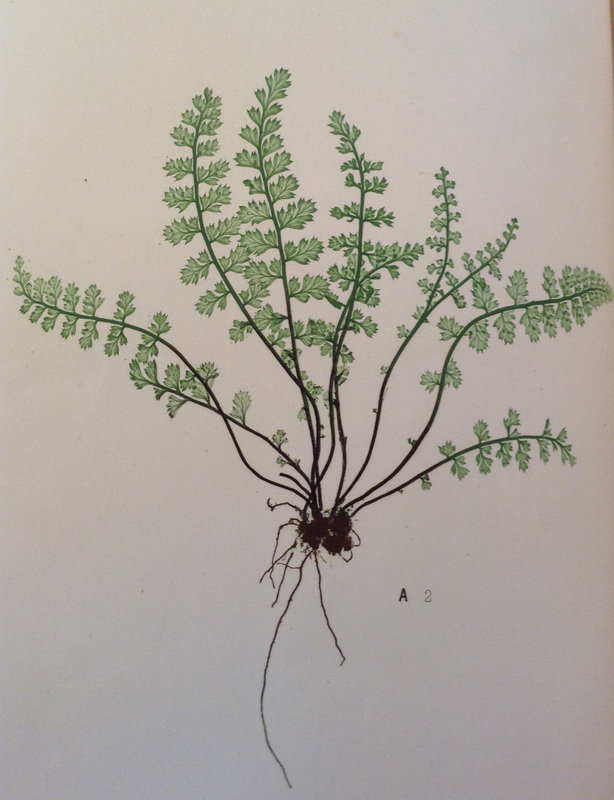 Of course ferns have been depicted primarily using the standard illustration processes of a given period, specifically engravings and chromolithographs when we look at the eighteenth and nineteenth centuries. But their format has led to a striking variety of documentary technologies. Ferns are (metaphorically, if not biologically) fruitful sites for experimentation with illustration techniques. 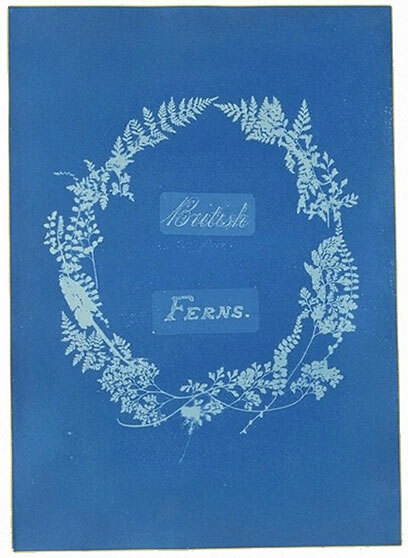 Anna Atkins, “Title page of British Ferns'” (1852) © Victoria and Albert Museum, London. 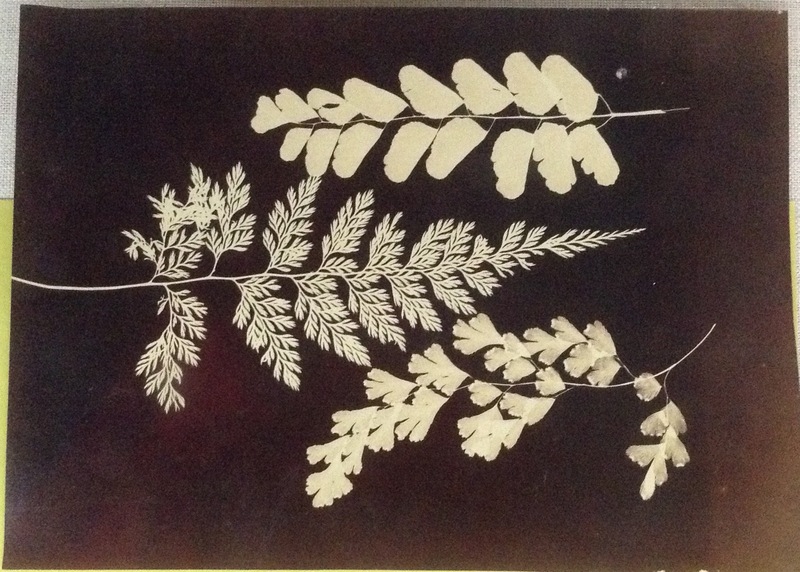 Perhaps the best-known examples of fern illustration are the cyanotypes produced by Anna Atkins, who used this early photographic method to document seaweeds and ferns. The cyanotype process is familiar to us today from architectural blueprints—and is widely available for both children’s art projects and home crafters. The technique entails placing objects on sensitized paper, exposing it to light, and then washing the paper to fix the negative image on a dark blue background. The cyanotype process is a type of photogram, a general term for creating a negative image on light-sensitive paper, no camera required. Dumbarton Oaks holds three photograms of ferns, all nineteenth-century French, and therefore of the same period as Atkins and fern mania. The Victorian fad for ferns also led to experiments with using ferns as stencils for paint or for smoke, using soot from candle smoke to produce negative images of ferns on blank paper. Ferns appeared in a wide variety of decorative arts, including ceramics and architectural details. For more on this trend, see a previous post on this blog. Another experimental type of image often associated with ferns is the nature print. While photograms make a negative image of an item against a darker background, nature printing most often uses the physical specimen to make an impression on a printing plate. The two most familiar names in the history of this technique are Alois Auer, of Vienna’s Imperial Printing Office, and Henry Bradbury, who produced the illustrations for Thomas Moore’s The ferns of Great Britain and Ireland (1855). These illustrations make use of the softness of lead plates. Ferns were placed between a plate of lead and a plate of steel, exposed to pressure, and then removed; the lead would retain an impression of the specimen, and could be used to produce an electrotype plate for printing. It is obvious that Bradbury’s plates were created from specimens—one can see the flaws and characteristics of the specific plants. 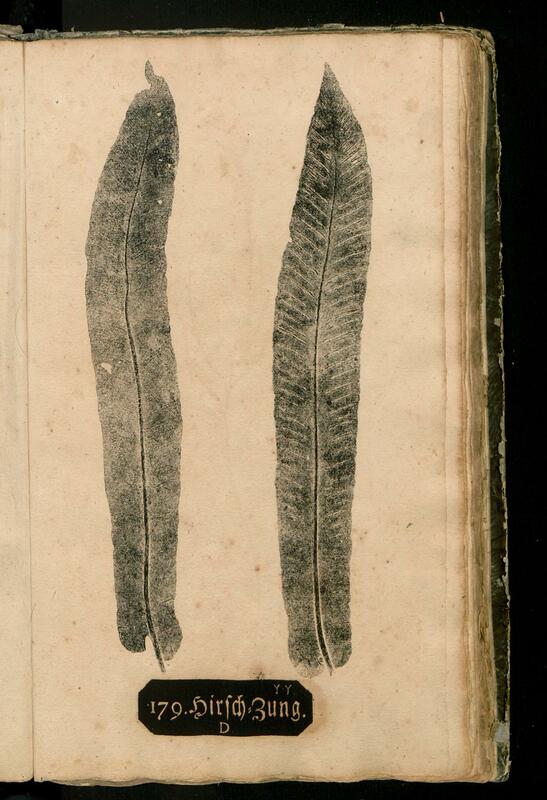 The plates do an excellent job of depicting fronds and stems, including veins and other minutiae. In many cases the roots are reduced to a blur. In some instances the locations of sporangia have been added by hand—a creative attempt to compensate for something left out in the process of creating the nature print. Both Auer and Bradbury were active in the 1850s, and each developed methods that entailed using a plant to create a plate. 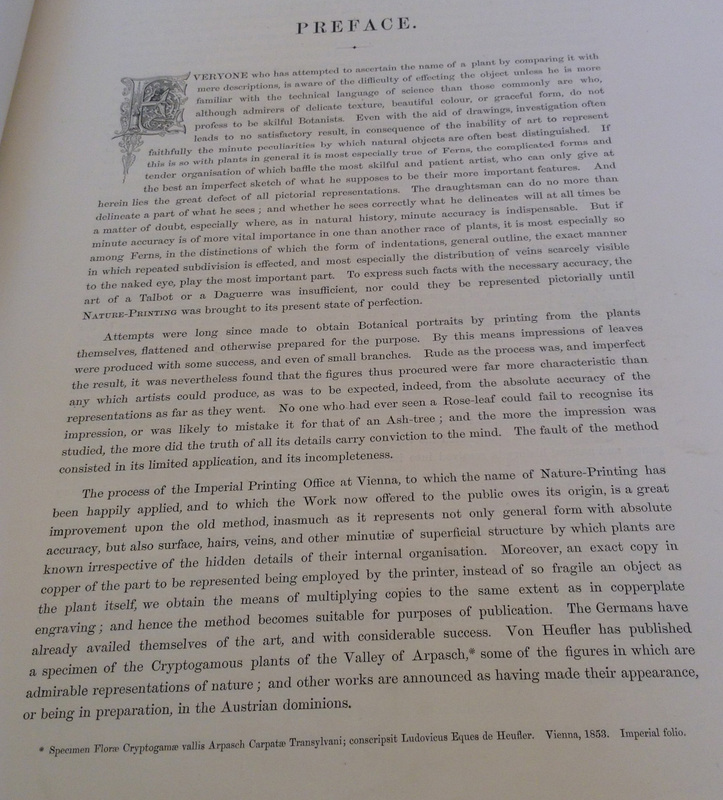 Over the centuries, there have also been many examples of printing directly from a plant. One fifteenth-century example, which includes a fern, is now found in the Universitätsbibliothek Salzburg. 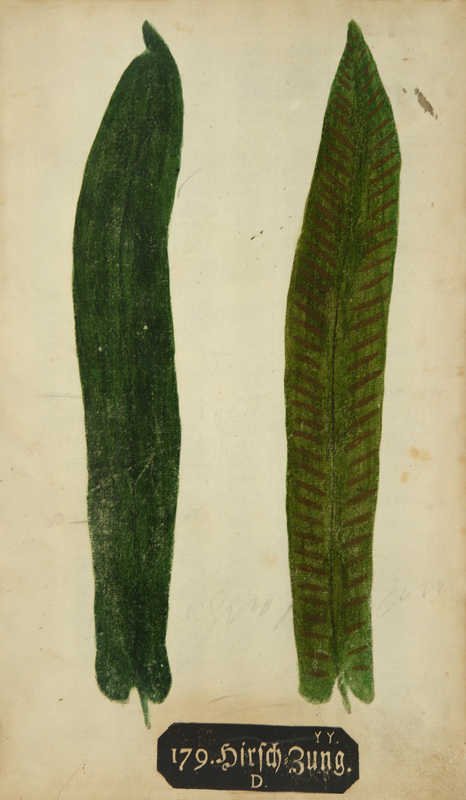 A new acquisition to the Dumbarton Oaks collection is Johann Hieronymus Kniphof’s 1733 “herbarium vivum.” He continued this effort in several subsequent publications, but this was his first, and it is a fascinating example of experiments in capturing the likeness of a plant. Scientifically, many of the illustrations lack important details; the more useful parts of many illustrations have been added after the fact, by hand. But there is something particularly compelling about the desire to document a specimen with such fidelity. For comparison, here is the same print without the hand coloring, from ULB Sachsen-Anhalt. Photograms and nature prints were for the most part superseded by advances in photographic reproduction in the late nineteenth century. Much has been written about the meaning of changing modes of botanical representation—a quick nod to Daston and Gallison’s Objectivity will have to suffice for now—but it should be said that although there may be a general trajectory by which one can track changing trends, there are always interesting experiments occurring around the periphery.